Added support for Bioshock Infinite. Added support for Remember Me. Added support for Alpha Protocol. Fixed several bugs with UT3 and Mirrors Edge. Fixed an issue with Hex Viewer. Added a new feature to search objects by group. For example if you input Commandlet.Main then UE Explorer will search for the class Commandlet and output its Main function. Open In -> Hex Workshop: It is now very easy and quick to open Hex Workshop with the opened file and auto scrolls to where the buffer is located. View Tokens: A much more detailed output. 1. Shows the corresponding buffer of each statement. 2. Memory and Storage positioned, and basic structure explanation built-in so you won't forget! 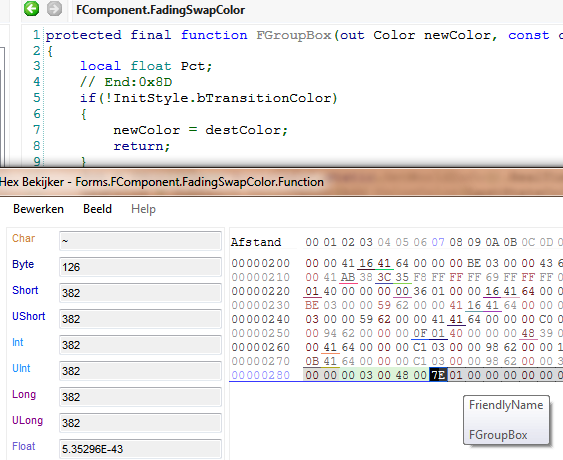 Updated the Hex Viewer to highlight selected and hovered tokens. The pink is a JumpIfNot token's content, then the more purple/pink color is the IntConstToken's content. 1. Copy Address, Copy Size. 2. Dump bytes will now replace the hyphen with a space delimiter. 3. Reload Package and Reload Buffer. Auto-Updater: UE Explorer will now check for updates upon launch and give you the option to download and install with an ease. Engine Licensee Version is now displayed if available(e.g. Borderlands 2). Recently Opened Files now displays its full path. Streams are now opened with shared writing, so you can edit using your favorite Hex Editor and then using the Hex Viewer in UE Explorer you can hit CTR + D to update and preview its changes immediately. 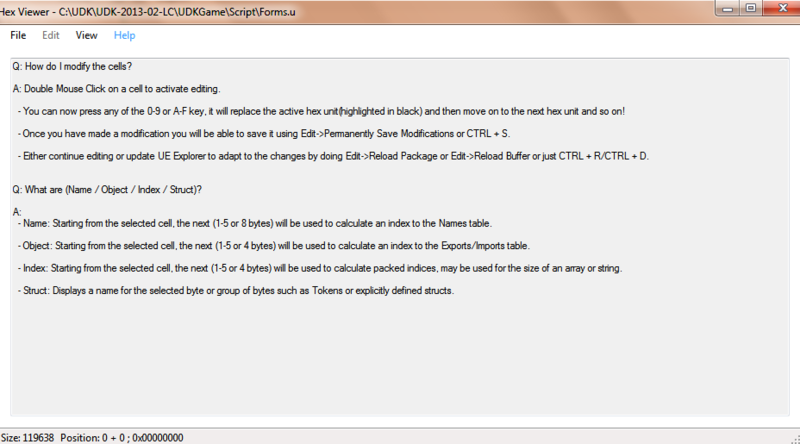 Function calls with skipped parameters are now output correctly for UE3 packages. Some Memory versus Storage size fixes for certain tokens. Support for the new StateVariableToken and decompiling of Local variables in States. When can we download this awesome update - to have possibility to edit in live ? (06-04-2013, 08:27 AM)DeulVai Wrote: When can we download this awesome update - to have possibility to edit in live ? Oh, sorry I haven't put it out yet, I planned to do that the week of this post but apparently I was distracted towards my other projects I've been working on, I'll have a look at this tonight but nothing guaranteed! I'm having trouble getting the auto-update system to work, it stopped working all of a sudden, just nothing happens even though I told it there's a new update , spent couple of hours yesterday trying to solve this with no luck! Current time: 04-23-2019, 12:24 AM Powered By MyBB 1.8.3, © 2002-2019 MyBB Group.